At A to Z Plumbing & Drain, we are fast to respond 24 hours a day when our customers have plumbing emergency or a plumbing question. Please call us at (647) 287-9589 or (416) 519-4919. Read our Clients' Testimonials and rest assured that we will work hard to get one from you! Send your questions using this form. We constantly monitor our mailbox and will respond quickly. 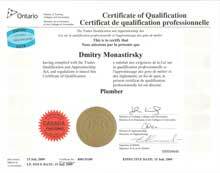 We are located in Toronto near Mississauga at 82 Algoma St, Toronto, ON M8Y 1C5, Canada. (c) A-to-Zplumbing.com (2011-2015) A to Z Plumbing & Drain, 82 Algoma St, Toronto, ON M8Y 1C5, Canada (647) 287-9589 Etobicoke Plumbing Contractors serving Toronto, Mississauga, North York, Thornhill, Richmond Hill, Scarborough and all of the GTA. Plumbers providing 24 hour emergency service. You save $$ by getting a second opinion from us. Call us now and start saving. "I would strongly recommend Dmitry and A to Z Pluming & Drain to anyone who needs a job completed on time, with market competitive prices and friendly service. A truly professional service provider. "